The F850-X2 Weigh-In-Motion instrument is full-featured device based upon the standard hi-speed (100 update / sec) F850 digital weight indicator. The F850-X2 has multiple selection options to improve speed and accuracy of the individual axles crossing the scale platform. A typical operating speed is 5 Km/Hr (actual accuracy depends upon axle spacing and size of platform scale.) 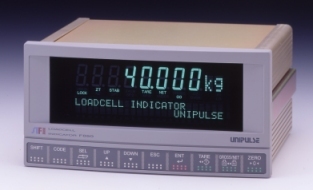 Up to 100 separate truck axle and loading configurations can be stored in the instrument. The F850-X2 measures the dynamic tire forces generated by each axle moving across the scale platform and then accumulates all the axle weights to give you a total weight of the vehicle.The unit can be interfaced with any strain gage based scale platform to create a permanent (or portable in-motion axle weight system. A primary consideration in favor of the F850-X2 compared to other in-motion systems is that it does not require any photo sensors or loop detectors to trigger a weighing sequence or operate properly. Built in algorithms in the F850-X2 handle the start and stop functions automatically. This dramatically simplifies setup and operation, as well as eliminates the need for additional costly peripheral devices. The only optional equipment necessary to complete the system is a remote display and traffic light unit (these are linked with the standard SI/F2 hi-speed serial output), plus a printer (interfaced via RS232) for hard copy documentation.. The lack of in ground mechanisms (loop detectors and photo sensors) greatly reduces the cost and installation time in upgrading existing axle scale installations. The F850-X2 is typically setup to display 1:10000d on the display, however a higher 1:40,000d expanded mode is available. Speed settings, cycle time outs, HI-LO limits, zero adjustment offsets, and analog and digital filters are all used to "fine tune" the instrument at the application site. If an individual axle doesn't reach the correct threshold value, is moving to fast across the scale, or is out of tolerance in another manner, that axle weight is shown as in "error" on the F850-X2 display.